A very special gift to welcome the new baby girl. This classic mini Radio Flyer wagon is loaded with useful and adorable goods. 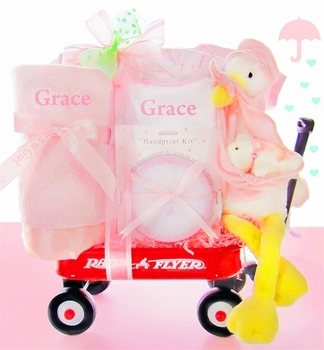 If you desire, the soft plush blanket and terrycloth bib can be personalized with the name of the new arrival. We send these to all of agents when they have babies!. These are so cute and different! Love the little wagon. ConsTime it takes to get them personalized and delivered.